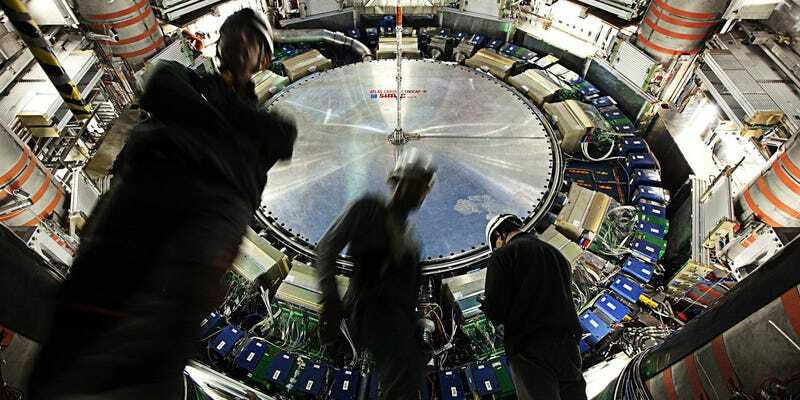 Researchers at the Large Hadron Collider have seen the first traces of what they believe could be a new fundamental particle. At a meeting on Tuesday, two separate teams of physicists reported that they’d made observations at the LHC which appear to hint at a new kind of particle. Both the Compact Muon Solenoid (CMS) and ATLAS (A Toroidal LHC ApparatuS) experiments at the LHC have detected a number of events that produce two photons at energies of around 760 GeV, shown in the experimental image below. The CMS team has prescribed the results a statistical significance of 2.6 sigma, while the ATLAS team’s has 3.6 sigma. These sigma values are a measure of how likely the results are to represent the presence of a hypothesized particle: for a result to be deemed a ‘discovery’ requires a sigma value of five, which equates to a 1-in-3.5-million chance of the result being a simple fluke rather an actual particle. A value of three is deemed to be an “interesting” result, with a greater chance of being a coincidence. But all discoveries start with a low value of sigma—and in some cases, like with the Higgs boson, that value continues to increase. Indeed, there’s already some speculation about what the results could be associated with: it may be a heavier version of the Higgs boson itself, or perhaps a graviton, the potential quantum carrier of gravity, according to the physicists who spoke to the New York Times. Right now, though, it’s far too soon to pop champagne corks. The most likely explanation given the current experimental data is that the observations from the two independent experiments are simply a coincidence. Fortunately, there’s time to gather more data. Since March, the Collider has been running at full-power and just last month it began colliding lead ions at the highest energies ever recorded. In 2016, then, the datasets that the CMS and ATLAS teams get to study will grow—and hopefully with them, so will those values of sigma.